In recent years, home gardeners and small farmers have become more interested in growing hops.Several years ago, University of Illinois Extension Logan-Menard-Sangamon Master Gardener volunteers decided to experiment with growing hops in preparation for it being Herb of the Year in 2018.They planted two varieties (Humululs lupulus 'Aureus' and Humulus lupulus 'Newport') in the Herb Demonstration Garden. Each year, these vigorous vines catch the attention of visitors and prompt many questions. The hop plant is a hardy perennial (zone 3 to 8) with an overwintering root stock that produces annual vines growing 15 to 20 feet high per year.Each winter, the vines die back to the ground. There are separate male and female plants, and only the female plants produce the cone-like structures called strobiles. The strobiles contain lupulin glands, which contain the essential oils and resins that give hops their aroma. The hops plant needs full sun, well-drained soil, with a pH of 6.0 to 7.0, and some protection from the wind. Rhizomes are planted in the spring. In mid-May, train vines to go up support systems. 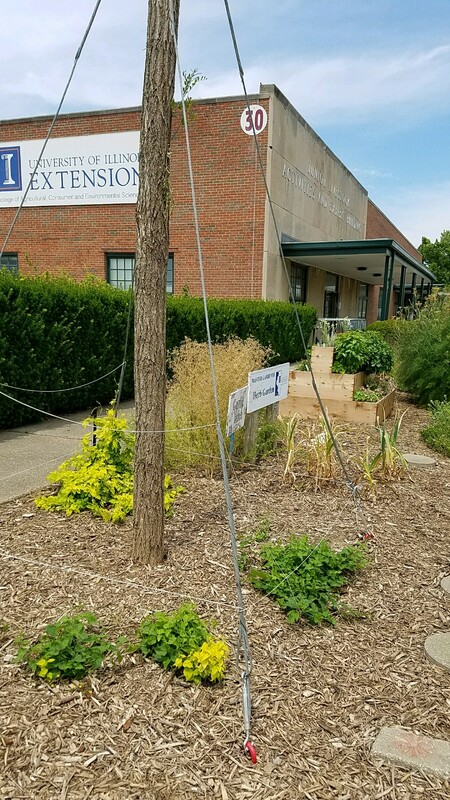 In May, the Master Gardener volunteers divided the overgrown hop plants and installed a new trellis support system using a 13-foot Black Locust post and sturdy wire cables attached in maypole fashion.The post rises 10 feet out of the ground, with three feet below ground to provide adequate support. Three or four vines were trained up each cable where they will twine clockwise to the top.The vines will send out side branches which will produce blooms followed by cones. The vines will require regular pruning to promote good air circulation and healthy growth. 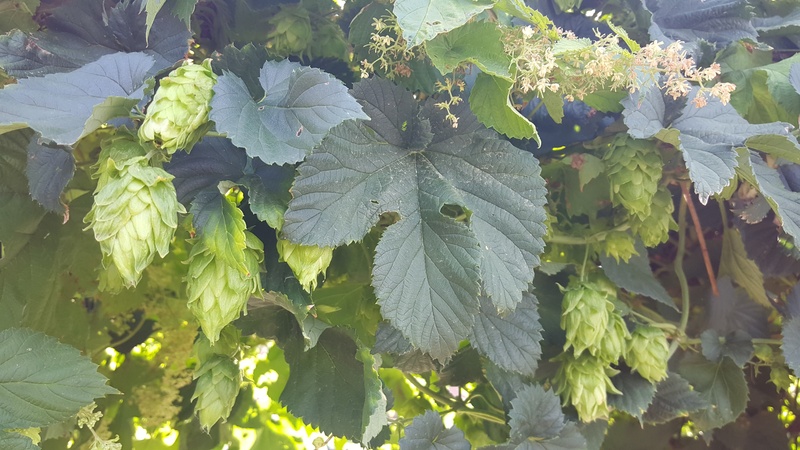 Pictures show hop cones and the installation of the Hop's support system.Feel free to drop by the Herb Garden to check out this new and interesting feature. 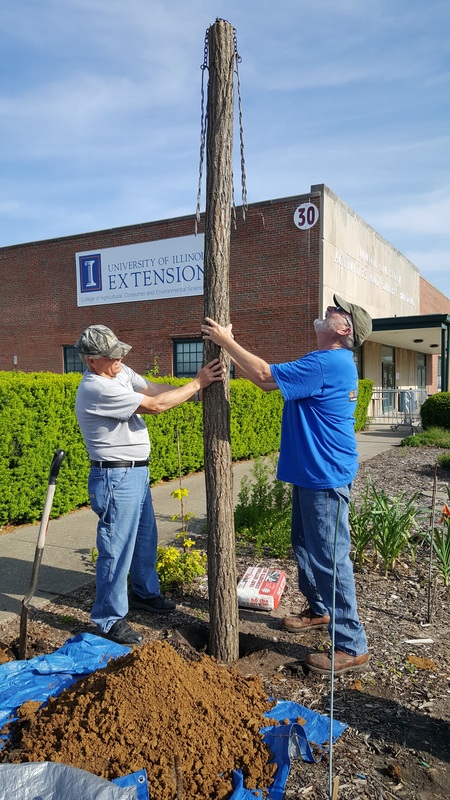 The Herb Garden is located on the Illinois State Fairgrounds, in front of building #30 along 8th street in Springfield. For more information on "Growing Hops in the Backyard" visitRutgers Cooperative Research & Extension, https://njaes.rutgers.edu/pubs/fs992/ . Contributing author and photos by Barbara Rogers, Master Gardener volunteer.